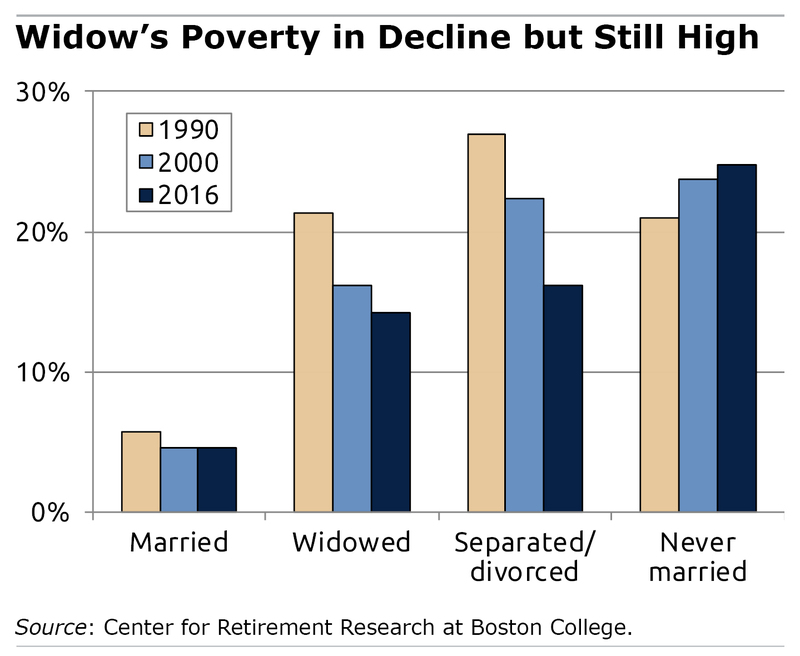 The irony today for wives who worked is that their decades in the labor force generally improve their financial prospects when they become widowed. Yet, under Social Security’s longstanding design, they receive less generous benefits than housewives – relative to the household’s benefits prior to the husband’s death. First, consider the couple with only one breadwinner. Under Social Security, the retired husband collects a benefit based on his past earnings – his wife gets a spousal benefit equal to half of that amount. Once widowed, she begins receiving his benefit, and hers stops. This leaves the widowed housewife with 66 percent of the income the couple had received. But today, because so many women are working, more retired wives get a Social Security benefit based solely on their own work histories, and this benefit exceeds the spousal benefit. Once widowed, she gives up her benefit and receives his benefit (assuming his earnings were higher than hers). The result is that, despite having worked, the drop in her income is larger than it is for widows from one-earner households. So what can be done to help women, who are much more likely than men to become widows? The researchers cite one reasonable proposal that would set all widow’s Social Security benefits – whether they worked or not – at 75 percent of the couple’s previous combined benefit. The increased cost to the program could be funded by reducing spousal benefits. This would effectively shift money from when both members of a couple are alive to the surviving spouse. Working wives are now so common that it may be time to rethink widows’ and spousal benefits. Instead, they could simply purchase an insurance policy (like my parents did). With the statistics regarding couples’ longevity, it would certainly pay off. Prior to his death (from lung cancer in 1990), my father had significant medical expenses. But they had planned responsibly, and upon his death she received not only his Social Security benefit, but also the joint-and-survivor annuity, and a very good life insurance payout. Her lifestyle was never adversely impacted to the day she died, 26 years later (in 2016). This is not rocket science. Canada has attempted to address the survivors pension poverty problem in two ways. First, the survivors pension benefit under the Canada Pension Plan is 60% not 50%. Second, when workers with private pension plans retire in Ontario, there is an automatic election of a last survivor 60% pension benefit unless the spouse declines the benefit. The combination of spousal protections under both government and private sector pension plans has drastically reduced poverty among surviving spouses. U.S. law was changed a number of years back to require spouses to sign off on any pension option that did not provide a survivor benefit. Essentially, your spouse owns one-half of your retirement benefits. Still, many spouses may not have understood what they signed away. I believe that may vary by state. I’m married to someone with a pension in Pennsylvania, and she did not have to consult me at all regarding her decisions on its disposition. My bad. Public pensions aren’t under ERISA, which is where that requirement comes from. The Knights of Columbus was the first to consider survivors poverty and started the inexpensive insurance options for families. Perhaps govt paid insurance might be an alternative. I thought we were very responsible (and careful) in planning for our retirement. My husband was laid off from several jobs at various times and that hurt our plans. A family company went bankrupt and messed up the retirement and subsequently medical benefits. I went to work at Walmart (at 5$/hour) to get medical insurance. The old saying “the best laid plans” sometimes doesn’t work, even though you are planning on it. However, my husband did plan for retirement through his Air Force retirement (at age 60.) When he passed away, I received 35% of that benefit. This idea sounded great — right up until the suggestion of funding it by reducing spousal benefits. As a spouse who is approaching Social Security age, I would not regard favorably a cut in benefits for which we have planned. I worked, but primarily I stayed home to raise children, so my own Social Security benefit is smaller than half of my husband’s. We are planning on applying for mine first and my husband taking half of mine until he turns 70, at which time we will reverse benefits. Waiting until 70 for the higher earner to collect is another good way to increase the survivor benefit for widows.